Closed storefronts are typical in American cities across shopping malls that once flourished in commercial zones of suburbia are now empty and abandoned. As the retail apocalypse deepens, more than 3,800 stores are expected to close across the country this year. Department stores like Kmart, Macy’s, Sears, and JCPenney, and retailers including Best Buy, Payless, BCBG, Abercrombie & Fitch, and Bebe have decided to close dozens of locations. A new report by real estate research firm Reis noticed that shopping malls had not been this empty since 2012, CNBC reported. The vacancy rate at regional and super-regional malls in the U.S. reached 8.6 percent in the second quarter of 2018, up from 8.4 percent in the prior quarter. The increased vacancy rate is simultaneously occurring while online retailing giant Amazon continues to acquire a more significant share of the consumption pie. According to Reis, the vacancy rate of malls could significantly jump over the next several years. Even Credit Suisse believes 25 percent of shopping malls will shut their doors by 2022. In March 2018, Abercrombie & Fitch announced it would close up to 60 more stores amid struggling sales and other closures in 2016 and 2017. The company has not announced if any of the New Jersey locations will close, and so far they’ve all stayed in business. Currently there are stores in Atlantic City, Bridgewater, Cherry Hill, Deptford, Eatontown, Edison, Elizabeth, Freehold, Paramus, Rockaway, Short Hills and Wayne. The retailer filed for bankruptcy in the spring of 2016, but in the fall of 2016 was acquired by a group of mall owners for $243 million. The sale was expected to save about 230 of Aeropostale’s 800 stores, according to Fortune. 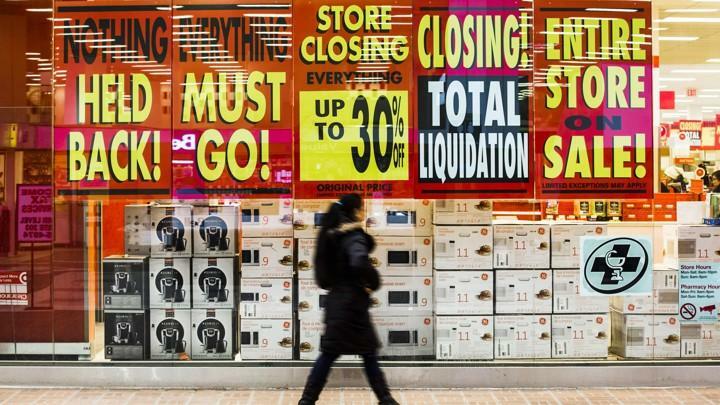 More than 100 stores were set to close after the bankruptcy filing, but the N.J. stores, so far, have never been on the chopping block. Edison-based women’s footwear chain Aerosoles has filed for Chapter 11 bankruptcy and will close a “significant” number of stores, the company said in a September statement. While the company didn’t disclose how many or which of its 88 locations will be shuttered, it said it will maintain four flagship stores in New Jersey and New York, and continue to sell online. The clothing brand filed for bankruptcy in 2016 and closed all stores, but its trademark was bought by Gildan Activewear. The company just recently opened its first brick-and-mortar store in L.A. after an online relaunch. The teen apparel retailer announced in 2017 that 25 to 40 stores across the country would close, but so far its 20 New Jersey stores and outlets have remained open. In the summer of 2018, Ascena Retail Group — which owns the brands Ann Taylor, Dress Barn, Loft, Lane Bryant, Justice, Catherines andMaurices — announced plans to close 25 percent of retail stores (about 250 locations) by the end of 2019 and an “additional 400 or so stores … through landlord negotiations during the same period,” according to RetailDive.com. In September 2017, Gap Inc. announced it would close 200 Gap and Banana Republic stores over the subsequent three years. The company, however, said that it plans to open 270 new locations for Old Navy and Athleta. No N.J. closures have been announced. The book giant said in 2013 that it would close a third of its retail stores by 2023. These days, B&N has struggled to sell its Nook device and just abruptly fired its CEO. Several New York stores have shuttered; all of the New Jersey locations but one (North Brunswick) have survived so far. The clothing retailer filed for bankruptcy in February 2017 and will close more than 100 stores across the country. About a dozen N.J. locations, including some in Lord & Taylor and Bloomingdale’s department stores, have remained open. The women’s clothing retailer shut down all its U.S. stores in 2017 amid struggling sales, but continues to sell online at bebe.com. In March 2018, Best Buy announced plans to shut down it’s small mobile phone kiosks, though no closures of the main stores have been announced. Bon-Ton, which operates 250 locations nationwide, announced in April that it will liquidate all U.S. stores after a bid for the company’s assets was accepted in bankruptcy proceedings. The department store has two N.J. locations, in Brick (80 Brick Plaza) and Phillipsburg (1200 Highway 22 East), both of which are still currently open. In August 2018, Brookstone — the mall staple known for its tech gadgets and massage chairs — announced plans to close its 101 mall stores, including seven locations in New Jersey, after filing for bankruptcy. The beauty and accessories chain filed for bankruptcy in December 2017 and plans to close 100 stores. No word yet on the fate of the seven N.J. locations. Chico’s, which also owns White House Black Market and Soma, said it would cut 240 jobs and close 120 stores, though which stores will close has not been announced. This year, the company announced “a collaboration with Amazon.com that will see a selection of Chico’s brand products go on offer on the e-commerce platform,” according to fashionnetwork.com. In March 2017, the Secaucus-based chain announced plans to close 300 stores by the end of 2020, upping the number from a previous plan of closing 200 stores by 2017. No word yet on which, if any, of the 43 New Jersey locations are slated to shut their doors. In March 2018, the teen jewelry and accessories brand announced it would close 92 stores as it files of bankruptcy, including N.J. stores in Voorhees, Livingston, Jersey City, Hackensack, Rockaway, Edison and Toms River. In 2017, Crocs said it will close 160 stores due to falling revenues. The shoe retailer has four locations in New Jersey — in Atlantic City, Blackwood, Elizabeth and Tinton Falls — but those stores have survived the closures so far. CVS will close 70 stores to save $265 million, but the chain has not announced the location of the closures. In December 2017, CVS announced it had completed an acquisition of Target’s pharmacy and clinic businesses for $1.9 billion. The shoe and athletic-apparel retailer will close 150 stores by 2020. In January 2016, the company blamed issues and losses on a new warehouse management system it had introduced, which, according to a report by the Wall Street Journal, caused order-processing issues, leading to millions in lost sales. Finish Line has not announced which, if any, of its 33 N.J. locations are closing. In March 2018, the shoe chain announced it would close 110 stores (after closing 147 in 2017), but it also plans to open 94 new locations this year, according to Business Insider. After slumping sales, GameStop in March 2017 announced plans to close between 150 and 225 locations. Which stores will be closed has not yet been revealed. In April 2018, the vitamin and wellness chain announced plans to close 200 stores this year. No word yet on which stores will close. In a March 2017 earnings call, Guess’ CEO announced 60 stores would close and that more could be shuttered in 2018. The retailer has not announced which, if any, of its New Jersey locations, will close. Faced with a June 2017 interest payment on its more than $1 billion in debt, children’s clothing chain Gymboree filed for bankruptcy and announced plans to close up to 450 stores. The retailer has a dozen locations in New Jersey, but no specific store closures have been announced. In March 2017, the appliance and electronics chain announced it will close more than 100 stores across the country. Its three N.J. locations, in Moorestown, Mays Landing and Deptford at Woodbury, have since closed. JCPenney closed its locations at Rio Grande Plaza in Middle Township and at Garden State Plaza in Paramus as part of a larger plan to shutter 138 stores across the country. The department store has 13 other locations in New Jersey. The parent company of the men’s suit chains, Tailored Brands, is on track to close 250 stores. The closures include 80 to 90 Jos. A. Bank stores and 58 outlet stores, according to Fortune, though which stores will close next hasn’t been announced. Kmart, which is part of Sears Holdings, will also close stores in New Jersey. The company will close 42 stores across the country, including seven here: Clementon, Clifton, East Brunswick, Pleasantville, Mantua, Manahawkin and Rio Grande. The women’s clothing chain closed all 250 of its locations, including New Jersey stores, in January. The chain is continuing to sell online. The department store will close “up to 10 stores” through 2019, including its Fifth Avenue location, “in order to better balance the brand’s brick and mortar presence with its online channels and increase profitability,” a spokeswoman told NJ Advance Media. Lord & Taylor has not announced which stores will close. Macy’s announced it will close 68 stores across the country, cutting 10,000 jobs, after disappointing holiday sales. Three N.J. locations have closed, in Moorestown, Voorhees and Wayne. The mattress retailer announced it would close 274 stores, but open about 75 new stores. No word on the fate of the more than 100 N.J. Mattress Firm locations. The namesake retailer of the “Project Runway” judge, Michael Kors closed 125 stores in 2017. Michael Kors has New Jersey locations in Edison, Freehold, Lawrenceville, Bridgewater, Elizabeth, Short Hills, Jersey City, Flemington, Wayne, Rockaway, Cherry Hill, Deptford, Blackwood, Atlantic City and Paramus that have so far remained open. The shoe retailer filed for bankruptcy in April 2018 and announced it would close all 70 of its retail stores. Nine West still sells shoes online. Office Depot has continued to shrink nationwide. In a 2016 report by the Consumerist, the office supply chain said it expects to close 300 more stores by 2019 to help cut annual costs by $250 million. The fate of the chain’s remaining N.J. stores is uncertain. Payless announced that it would close stores in New Jersey as part of the company’s plan to shutter 400 locations across the country after filing for bankruptcy in 2017. The New Jersey locations that will close are: Loews Shopping Center, East Rutherford; Marlton Crossing, Marlton section of Evesham; Mid State Mall, East Brunswick; Phillipsburg Mall, Phillipsburg; Bloomfield Avenue, Bloomfield; Acme Plaza, Cape May Court House section of Middle Township and Marlboro Plaza, Marlboro. In August 2017, the discount perfume retailer said it would close 64 of its 226 stores during bankruptcy filings. There are six Perfumania stores open in N.J.; a Woodbridge location has closed. RadioShack closed more than 1,000 stores across the country over the past two years, including all locations in New Jersey, but just announced a partnership with HobbyTown to open express store-within-a-store locations, according to CNN Money. Four New Jersey locations of teen clothing retailer rue21 were among 400 across the country that closed as the company filed for bankruptcy. Stores in the Livingston Mall in Livingston, the Ocean County Mall in Toms River, Jersey Shore Premium Outlets in Tinton Falls and Hamilton Mall in Mays Landing have closed, while stores in the Cumberland Mall in Vineland, Cross Key Commons in Turnersville, Moorestown Mall and Audubon Crossings remain open. In January, Walmart announced it would close 63 Sam’s Club locations, and immediately closed N.J. locations in Budd Lake, Princeton andLinden. There are seven Sam’s Club stores left in the state. In May 2018, Sears announced it will close another 62 stores across the country. In New Jersey, only the Vineland, Ocean and Burlington Sears locations have closed, but the location in Lawrenceville will close in September. In 2017, the office supplies chain announced plans to close 70 stores. Staples has about 75 locations in New Jersey. The company has not said if any of the N.J. stores will close. Starbucks has closed all 379 of its Teavana stores. There were 11 Teavana stores in New Jersey. Toys R Us kids all over mourned the loss of the toy retailer, which closed all stores in 2018. Jeans retailer True Religion has filed for Chapter 11 bankruptcy and will close 27 of its 140 stores as the company restructures. Only one New Jersey store has closed so far — the location at Garden State Plaza in Paramus. In 2017, the vitamin chain said it would close 124 stores. The only N.J. location that has closed was the one in the Phillipsburg Mall. Moorestown Mall, Woodbridge Mall, Bridgewater Mall and Jersey Gardens Mall (Elizabeth) stores have remained open. In early 2016, Walmart announced plans to close 154 stores, but so far has only closed one of their 70 N.J. stores; the location in Readington closed in Feb. 2018. The teen clothing chain declared bankruptcy and began closing stores in 2015. In 2017, the company closed all of its remaining stores across the country, including N.J. locations in Freehold Raceway Mall and Monmouth Mall.